To determine which HSA health insurance plan is better than the others we’ll use three scenarios to test them with. The first situation assumes that you have zero medical expenses in a year. The second situation assumes the total of your medical expenses is less than $4,000, and the third assumes the medical costs are over $15,000. 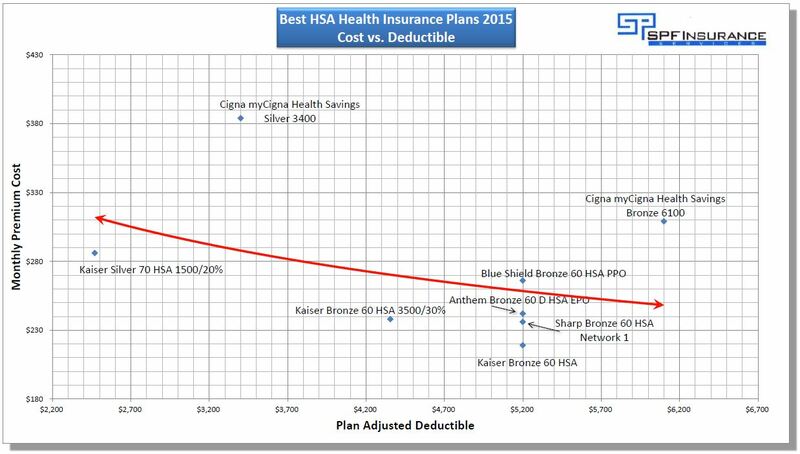 The best way to show the HSA health plan comparison is to graph the plans by price and adjusted deductible. The prices shown below are for a 35 year old in San Diego county. In this graph, the better HDHP plans are as close to the lower left corner as possible, and below the red line. That region has the lowest premiums and deductibles. The red line through the graph represents the average or trend-line of the plans. As you look at the graph you’ll notice there is a small groupings below the trend-line, and a couple plans further to the left. These are our best candidates for top plans. The larger grouping is the standardized Bronze HSA plan defined by Covered California. Each of these plans offers a $4,500 deductible, a 40% co-insurance after you meet the deductible, and an out-of-pocket maximum of $6,250. The main difference between these five plans is price, network, and insurance company. These two plans offer lower deductibles than the larger grouping, but are at a slightly higher monthly premium. In the first scenario where you won’t have any medical expenses for the year, the better option is the lowest cost plan, or the one your doctor accepts. In this scenario, the Kaiser Bronze 60 HSA plan is the best option. Sharp has the second best plan, but Sharp is a regional insurance company that only offers coverage in San Diego. Check your quotes to see if a small regional company is offered where you live. They may be a good fit, if your doctor is in their network. In the second scenario, where your medical expenses are $4,000, the better option will be the Kaiser Silver 70 HSA 1500/20%. This is because this Kaiser HSA plan has a $1,500 deductible, and then you begin sharing costs at 20%. The portion you would pay is the deductible, $1,500, plus 20% of the remaining $2,500, which is a total of $2,000. If you use the Kaiser CA Bronze HSA 3500/30 plan you would have a $3,500 deductible and would then share costs at 30%, so the amount you would pay is $3,500 plus 30% of $500, which is a total of $3,650. With any of the standardized plans you would pay the full $4,000 because those plans have a $4,500 deductible. In the third scenario, where your medical expenses are greater than $15,000, you will reach the out-of-pocket maximum in all but the Kaiser Silver 70 HSA 1500/20% plan. This Kaiser Silver HSA plan will have you pay only $4,200 of the $15,000 in medical costs, while with the other HSA plans you would pay at least $6,250. The difference in premium cost of the Kaiser Silver HSA versus the other HSA plans is low enough that the Silver plan is the winner in terms of cost. The key part is, do you want to go to a Kaiser doctor? For the majority of you, the first or second scenarios are more likely to happen. For Kaiser patients, the Kaiser Bronze 60 HSA is the best option. For everyone else, the Anthem Blue Cross Bronze 60 D HSA EPO, or the Blue Shield Bronze 60 HSA PPO are the better options. The decision between Anthem or Blue Shield being, which one does your doctor accept?